We had a huge social media response last week to our comparative article about the separation of powers in Australia and the US. Questions and comments about the role of Commander-in-Chief in Australia and the US kept popping up. While it’s clear that the President is the Commander-in-Chief in the US, it is less clear and somewhat confusing about who is responsible for this role in Australia. So this week we take a look at Section 68 of the Australian Constitution which stipulates the command of the naval and military forces. The executive power is vested in the Queen and exercised by the Governor-General (section 61), who is advised by the Federal Executive Council (section 62) and who must act on the advice of this Council when the Constitution refers to ‘Governor-General in Council’ (section 63). If you have a read through the Constitution you will see that term is stated 13 times. You’ll notice that this section does not refer to the ‘Governor-General in Council’, but rather the power is vested in the Governor-General as the Queen’s representative. So at first glance it could seem as though the Governor-General might have some prerogative here. However, the effect of these words is that the Governor-General may act on ministerial advice, rather than after a meeting with the Federal Executive Council. 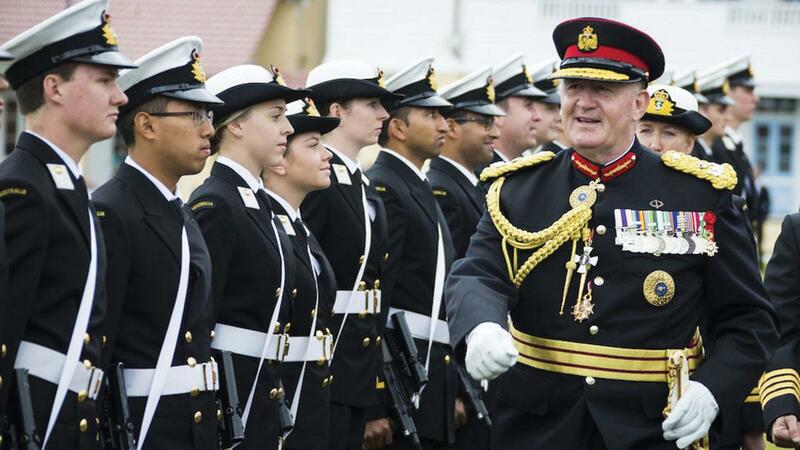 The command-in-chief of the naval and military forces of the Commonwealth is, in accordance with constitutional usage, vested in the Governor-General as the Queen's Representative. This is one of the oldest and most honoured prerogatives of the Crown, but it is now exercised in a constitutional manner. The Governor-General could not wield more authority in the naval and military business of the country than he could in the routine work of any other local department. Of what use would be the command without the grant of the supplies necessary for its execution? All matters, therefore, relating to the disposition and management of the federal forces will be regulated by the Governor-General with the advice of his Ministry having the confidence of Parliament. So if the Governor-General can only act on the advice of the Ministry is he or she the Commander-in-Chief in name only? Is the Prime Minister the person who has their ‘finger on the metaphoric button’? However, the Prime Minister is not even mentioned in the Constitution. While the role of Prime Minister is central to the functioning of Government, it operates by convention. This unwritten rule, the accepted way of doing things has been passed down by tradition, rather than being specified in our Constitution. Each party chooses their own leader and once a party controls the majority of the House of Representatives their leader becomes the Prime Minister. Our system of government is sometimes criticised because the Executive and the Legislature overlap (read the comments in last week’s article to see some of this criticism). But this overlap actually makes our Executive more accountable. The Cabinet and Ministry is responsible to the Parliament for every decision they make and they hold their positions with the support of Parliament. This is why you see Ministers being questioned in Senate estimates and other hearings where they have to explain their positions, policies and departmental legislation to the Parliament. Responsible Government is the term used to describe a political system where the executive government, the Cabinet and Ministry, is drawn from, and accountable to, the legislative branch. So the Governor-General acts on the advice of ministers who are then responsible to Parliament. If anything goes sour, ministers can be replaced and the system remains stable as the Governor-General and the Parliament continue. What role do Defence Ministers have? The Minister has general control and administration of the Defence Force. The Chief of the Defence Force has command of the Defence Force. Does this mean that one of the Defence Ministers or the Chief of the Defence Force is the Commander-in-Chief? And which Defence Minister would it be? In a Senate estimates hearing on Wednesday 19 October, Minister Payne did not want to be drawn into defining whether she or Minister Pyne were the senior Defence Minister. Senator Payne eventually insisted that she and Minister Pyne were of equal rank because they are both members of cabinet. The culture of our leadership is going to be one that’s thoroughly consultative. A traditional, thoroughly traditional cabinet government that ensures that we make decisions in a collaborative manner. The Prime Minister of Australia is not a president; the Prime Minister is the first among equals. And you can see that the partnership between me and Julie [Bishop], the partnership with our colleagues will be a very clear cultural demonstration that we are operating in a traditional cabinet manner. Who is the Commander-in-Chief in Australia? Is it the Governor-General as the Queen’s representative in Australia? This is what the Constitution says. We know that the Governor-General must act on his or her Ministers advice. So would you say it’s the Prime Minister? And where do the three Defence Ministers fit into all of this? Could it be that one of them is the Commander-in-Chief? Or is it perhaps the Chief of the Defence Force? Is there any one person who ‘has their finger on the button’? Purely titular my title of Commander-in-Chief may be, but it does reflect the quite special relationship that I believe exists between the Governor-General and the armed forces of the Commonwealth. It is a close relationship of sentiment, based neither upon control nor command but which in our democratic society expresses on the one hand the nation’s pride in and respect for its armed forces and, on the other, the willing subordination of the members of those forces to the civil power. The location of section 68 in chapter II of the Constitution makes it an executive power. Cabinet receives advice from the National Security Committee, the Australian Security Intelligence Organisation, DFAT, Defence Intelligence Organisation, Office of National Assessments, Australian Secret Intelligence Service, Defence Chiefs and other agencies before they collectively make a decision about whether they send Australian troops into a conflict. All of the cabinet are then responsible to Parliament. Should the Parliament have some say in the war powers? Australia is one of the last Western democracies that can send its citizens to overseas conflicts without any recourse to Parliament. The laws and legislation in place now that give essentially full control to the Prime Minister and the executive date back to the feudal times of royalty. Both major parties support the current arrangement where the cabinet makes the decision about whether Australia commits troops to any conflict. Often during times of war decisions need to be made quickly and defence and security advice given to the Cabinet cannot always be debated publicly in Parliament. Others argue that these difficulties could be overcome? What do you think? As always, please feel free to make your comments below. We do ask that you please remain respectful to other contributors. If you would prefer a more raucous discussion you can join us on Facebook.